Saturday, May 26 2018 /5 P.M.
Zhang Lin 張林 Mr. Zhang Lin is a human rights activist who as a student participated in the 1989 pro-democracy movement in China. He had been imprisoned on and off in China for over 13 years since 1989 for his relentless support for a democratic China and human rights in China. His younger daughter had been called the youngest prisoner of conscience when the authority prevented her from attending school as a punishment for her father. She and her older sister successfully left China for the US five years ago and have been hosted by Reggies Littlejohn, the President of Women's Rights without Borders. Ms. Littlejoin is the recipient of Visual Artists Guild's 2012 Spirit of Tiananmen Award. Mr. Zhang was able to escape from China early this year. Ms. Li Wenzu is the wife of human rights attorney Wang Quanzhang. Mr. Wang was one of the over three hundred human rights attorneys and assistants who were swept up by China's government in September 2015. While all those who had been detained had since been either sentenced to jail or released under certain house arrest, Mr. Wang had not been heard from since. Ms. Li has continuously been appealing to the government for information about Mr. Wang but to no avail. On April 4 this year, the 1000th of Mr. Wang's disappearance, his wife started a 60 miles walk from Beijing to Tianjin where she believe her husband was held. However, after six day, she was forcibly returned back to Beijing and has been under house detention since. Dhondup Wangchen 當知項欠 Tibetan film-maker Dhondup Wangchen was arrested in March 2008 after he had completed filming a series of interviews with Tibetans who had bravely voiced their feelings on the upcoming Beijing Olympics. The interviews were smuggled out of Tibet and made into a remarkable film, Leaving Fear Behind, which has been screened in more than 30 countries and was secretly shown to journalists on the eve of the Beijing Olympics. He was sentenced to six years in prison for "subversion" and subjected to prison labor and months of solitary confinement. Mr. Wangchen successfully escape to United States last year. Environmentalist Wu Lihong, 2013 recipient of Visual Artists Guild's Champion of Freedom of Speech Award, is still under surveillance by the public security of China. Mr. Wu also received the 2007 Conde Nast Traveler Envoronmental Award. His daughter will attend this event to update on what her father is struggling to do for Lake Tai. Poet Zhu Yufu, also 2013 recipient of Visual Artists Guild Champion of Freedom of Speech Award, has been released from prison. His daughter will attend this event to update about her father. Pay by CHECK If you prefer you can send a check. To pay by check, please specify your order inside the check payment form. Please mail check no later than May 20, 2018 to Visual Artists Guild, P. O. Box 861132, Los Angeles, Ca. 90086-1132. Zhang Lin 張林 is a human rights activist who had been imprisoned on and off for 13 years since 1989. His young daughter had been called China's youngest prisoner of conscience when the authority prevented her from attending school. Mr. Zhang arrived in the US early this year after his release from prison last year. Li Wenzu 李文足, wife of detained lawyer Wang Quanzhang 王全璋 started to walk 100 km from Beijing to bring attention to her husband's plight but was forcibly returned to Beijing. Visual Artists Guild honored Mr. Wang last year with the Champion for Freedom of Speech. Mr. Wang has not been heard from for more than 1000 days since July of 2015 when his family received notice of his detention. Dhondup Wangchen is a Tibetan Filmmaker of the documentary "Leaving Fear Behind". He was sentenced to six years in prison for highlighting Tibetans' plight. In 2013, Visual Artists Guild honored him with the Champion For Freedom of Speech award which was accepted by his wife on his behalf. He was released last year and was able to escape to the United States last year. Entering 2018, we wish you a wonderful New Year. We will continue working with you in helping to bring attention to the many people whom we see as giving the world a spark for hopefulness and love. 2017 can be remembered as the year when China's president Xi Jinping consolidates his China dream beyond the imagination of the dystopian novel Nineteen Eighty-Four. Thought police are in all China's internet surveillance with the requirement of real name registration. WeChat, the all-in-one messaging calling app is being used by China as a national id that will make any user responsible for its own group chat as the government of China continuously censor speech and expression in pushing for their catch all phrase of "maintaining security". Western corporations became collaborators in censorship when Apple removed VPN apps that allow Chinese in China to bypass China's Great Firewall. 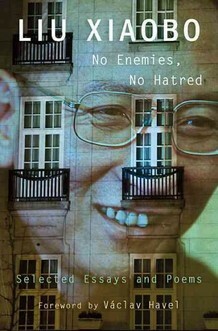 The death of Nobel Peace Laureate Liu Xiaobo in July brought to the world attention that any long term imprisonment by China may in fact be a death sentence. Liu was sentenced to 11 years in prison on Christmas day 2009; detained in 2008, he had less than two years left in his sentence. Yang Tongyan, 杨同彦 a writer and member of PEN, died in November after being released for medical parole in August for a brain tumor. Yang was sentenced to 12 years in prison in 2006 and was only a few months towards the end of his sentence. In 2014, attorney Cao Shunli 曹順利 died after she was detained in 2013 as she was leaving for Geneva for a review on China's human rights record. This pattern of causing the resultant death of detainees or prisoners in China is alarming. Currently, Visual Artists Guild is concerned that Huang Qi, 黃琦,a human rights activist who started an early web site "64 Tianwang" since 1998 and imprisoned twice before, is now in danger of dying while in custody. The 8 years sentence in December of blogger Wu Gan 吳 淦 is certain to result in his health deterioration in the future. While the world may celebrate China's commitment to the Paris climate accord, few recognizes that in a totalitarian government, the authorities can set their goal for peak emission by 2030 with no regard to how it will impact ordinary citizens. Minister of Environment Protection Li Ganjie's 李干杰; order to stop coal use by three million housholds in 28 cities around Beijing resulted in the destruction of coal stoves of those homes when replacements were mostly not ready during the depth of Beijng's deadly winter. Within the same policy of pollution control, China started to expel its low-end population "低端人口" when a fire broke out in late November in Beijing where 19 people died. The forced eviction and demolition of homes for migrant workers on Beijing is part of the government plan to limit population in Beijing in co-ordination with president Xi Jinping's plan for a "beautiful China" 美好生活as announced during the 19th Congress in October. Perhaps the most Orwellian nightmare China's government is doing is the collection of biometric DNA of the people in Xinjiang province where 11 million Uighur Muslims live. With pressure from China, Egypt and other countries have forced the return of Uighur students back to China where they have disappeared. One would wonder whether such data could be used for China's organ trade. Self-immolation in Tibet continues with seven this year. We must convince the Tibetans that ending one's life will not help to end the repression. Each and everyone of their life is necessary to continue to preserve Tibetan culture and language for the future. Bringing attention to China's human rights violations will help to give those in China fighting for their rights a ray of hope that the world is watching. China's government may proclaim beautiful policy to the world but the facts of such policy actions will belie the government's declarations. The Chinese Communists Party should review their own disastrous history to truly understand why they continue to fail their people despite such flowery policy such as the Great Leap Forward when over 40 millions died of the biggest man made famine in human history. The Great Firewall of China Marching Brigade. The parade starts at 11:00 a.m.
TIME: Do join us and be part of the parade; please be there by 9:30 a.m.
Our aim to present the current situation in Cuba in a way that is readily understood by the general audience. 53 political prisoners in Cuba were released in the beginning. However, many of those who refused to self exile themselves were soon re-arrested. Prisoners are forced to work 12-hour days and punished if they do not meet production quotas. The Ladies in White, a group of women who every Sunday after mass would silently march to press for the release of their loved ones have been routinely harassed, beaten and arrested. Currently, the Cuban government used a new tactic against the Ladies in White by detaining them before Sunday mass and then release them a day or so later so as to prevent them from their Sunday silent protest. Independent journalists, writers, academics and artists who expressed their thoughts are subject to arrests, smear campaign and termination of their jobs. Even reporting on the weather has become dangerous. Journalists Maykel Gonzalez Vivero and Carlos Alejandro Rodrigquez were detained on trying to report on the arrival of Hurricane Irma this year. Last year, they and Elaine Diaz and four of her colleagues were detained for reporting on the damages from Hurricane Matthew with Vivero being imprisoned for three days. Since late last year, U.S. diplomatic personnel and their family members have experienced "hearing loss, dizziness, headache, fatigue, cognitive issues and difficulty sleeping" according to the U.S. State Department. Although Cuba denied it, it is suspected that Cuba had used some type of sonic attacks on the U.S. diplomats and their family.